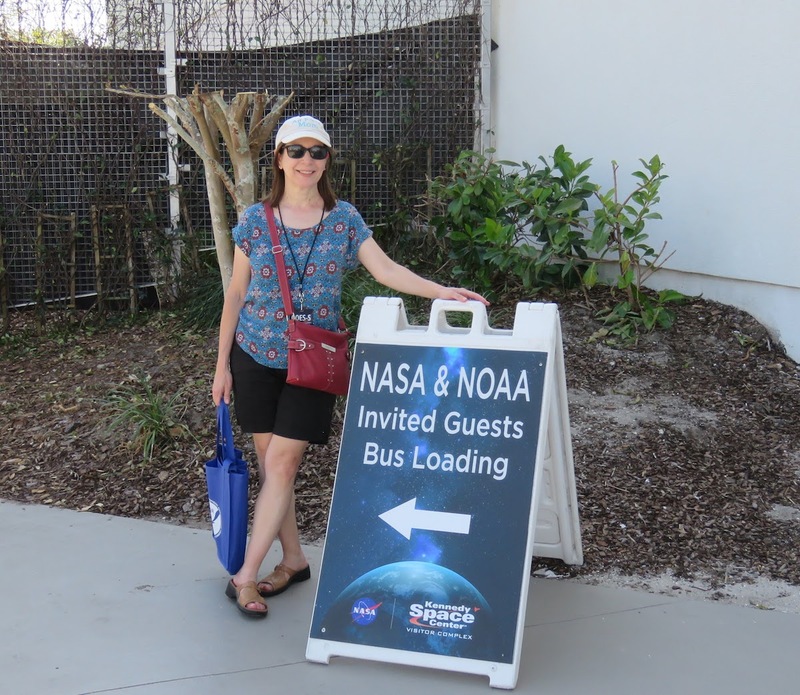 It was a short drive from the Visitor Complex to the Apollo/Saturn V Center, where we viewed the launch. On the way we passed the Vehicle Assembly Build (VAB). This enormous structure is one of the largest buildings in the world. It was originally used to assemble the Saturn V and Apollo spacecraft for lunar missions. Later, it was used for the Shuttle program. 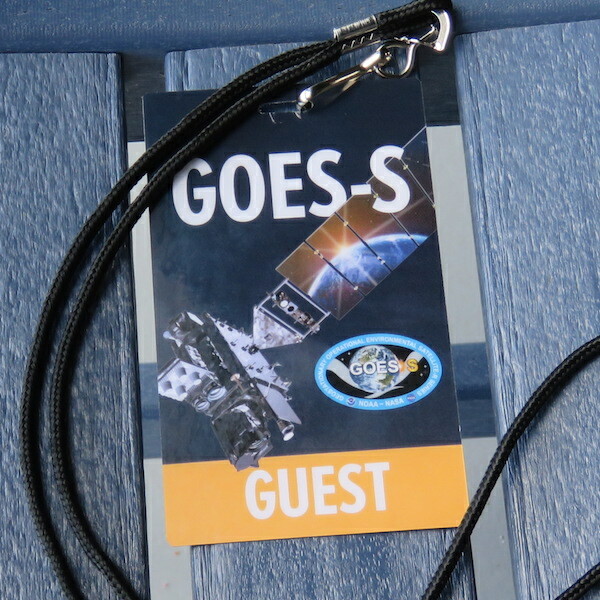 It will be used to support assembly of the Space Launch System (SLS) in the future. See the Shuttle Atlantis inside the VAB using this Google Map. Zoom in/out. Drag left/right/up/down. With a cell phone, point it left/right/up/down. The buses arrived at the Apollo/Saturn V Center shown in the interactive map below. Bleachers were arranged in the lower part of the map. A Saturn V and Apollo moon landing displays were in the long building in the upper part of the map. Our previous post shows pictures of them. Zoom out on the map to see the Shuttle landing strip left of the viewing center and the VAB below it. 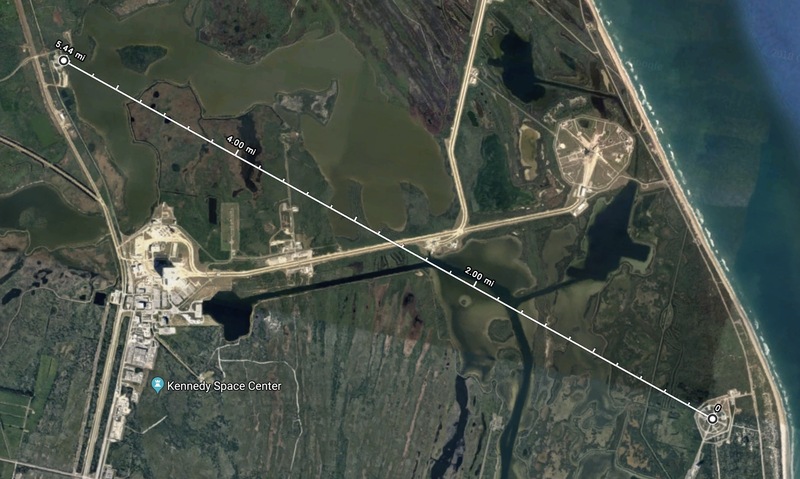 This Google Maps view shows the viewing site upper left and launch pad 41 lower right more than 5 miles away. We guessed it to be a shorter distance. Click to embiggen. The huge Vehicle Assembly Building is left center. This brief video shows our view of the VAB. It then pans left and zooms in on the launch pad 41 site to our southeast. We stood in a grassy area and listened to the audio feed from a NASA broadcast. It kept us up-to-date on the countdown, or so we thought. As it turned out, the audio feed was about 40 seconds delayed from the actual events. If you listen carefully to the video below, you might hear the announcer describe upcoming events that had already happened on our video. It was quite confusing to hear that and see the rocket already high in the sky. For both of us, this was a tremendous thrill. We feel privileged to have experienced the day, and are grateful for the opportunity. When the Weather Underground blog pages still were active, some years ago, it always was interesting around launch time because of the number of Florida bloggers up and down the coast from the space center. Every now and then someone would post photos of a launch taken from their back yard. I always thought that would be the neatest thing ever, to be able to just wander outside and get those images. I’m glad you two had that experience. Do you know the explanation for that 40 second time lag? Is that something that was instituted after the Challenger? I have no idea why the time lag. It was a very strange disconnect. I will see if I can find any info.